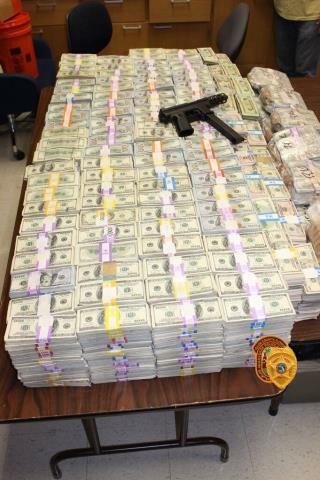 (Newser) – Luis Hernandez-Gonzalez runs a successful gardening store in Miami-Dade, but not quite successful enough to explain the $24 million cops found stashed in his wall. The 44-year-old was charged with offenses including money laundering and marijuana trafficking after police found the cash stuffed in 5-gallon Home Depot buckets in a secret compartment guarded by a statuette of St. Lazarus in a raid on Tuesday, the Miami Herald reports. Officers also recovered cash and marijuana from Hernandez-Gonzalez's "Blossom Experience" store, which they say caters to indoor pot growers with products like lights and fans. 24 million! I would have paid off a non extradition country 5 or 10 million ago. SO WHEN ARE THEY GOING TO RAID THE CLINTON FOUNDATION AND LOCATE ALL THOSE MISSING MILLIONS???? ?